Lapis lazuli with pyrite from Afghanistan. Lapis lazuli is a deep blue metamorphic rock, found in crystalline limestone, and consisting of lazurite mixed with other silicates, calcite and pyrite. It occurs rarely as crystals in the cubic system, but more often as granular masses. Hardness 5–5.5, relative density 2.4. 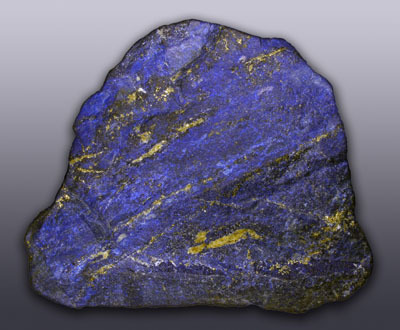 Lapis lazuli chiefly occurs in Afghanistan and Chile, and has long been valued as a gemstone and is cut and polished for ornamental purposes, but is too soft for extensive use in jewelry. As a powder it is the source of the pigment ultramarine.